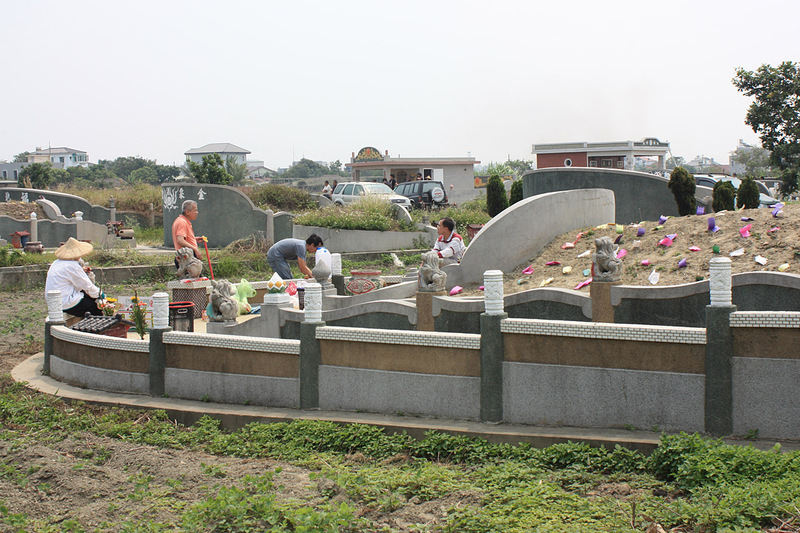 Traditional outdoor tombs in Tainan City. Living in Southern Taiwan, I am able to witness many traditions of Chinese culture that are disappearing in most other areas of Taiwan. One set of disappearing traditions are those that occur on the holiday known as Tomb Sweeping Day, or the Chinese equivalent of Memorial Day. It is the annual ceremony to honor the deceased ancestors, and to take care of their grave sites. This year, Tomb Sweeping Day (Qing Ming Jie) occurred on Monday, April 5th. The event is significant enough to be a national holiday in Taiwan, with schools and most businesses being closed. Exploring a tomb city in Tainan City. One reason the traditional customs of Tomb Sweeping Day are disappearing is because the traditional Chinese outdoor tombs are becoming harder to find. The traditional outdoor tombs range from the simple to ornate, but they typically take up quite a bit of space. The tombs are also usually placed facing the homes of the deceased, so in Southern Taiwan, you can find many tombs facing West towards mainland China. It is surprising how ornate some of the tombs can be. 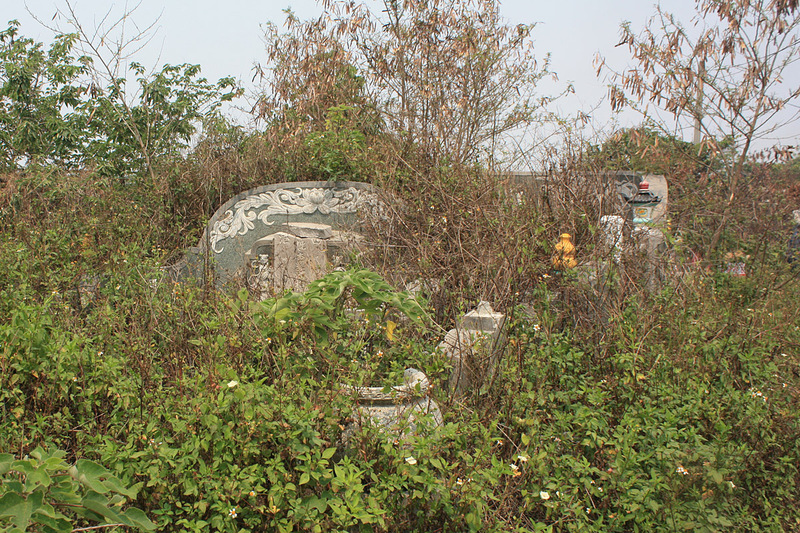 A traditional tomb overgrown by weeds before being cleared and cleaned. Close-up of a traditional tomb overgrown by weeds. 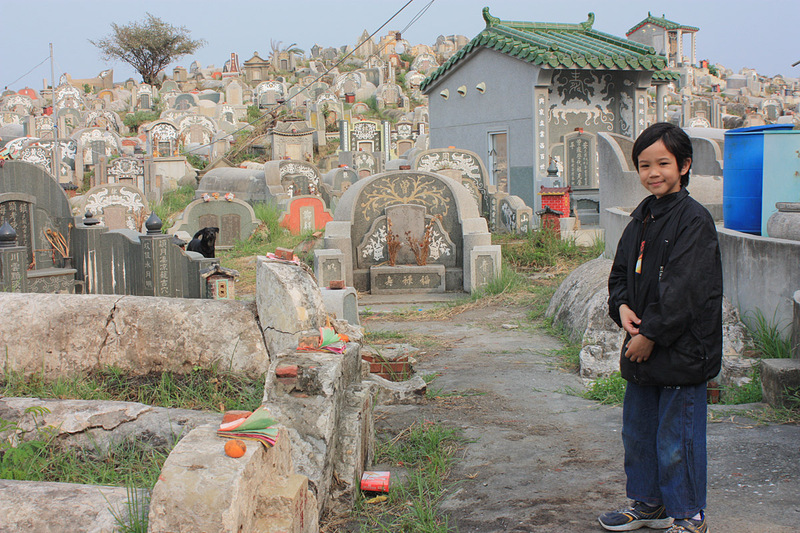 Around the countryside in Tainan County, I witnessed caravans of families gathered around the traditional burial plots that typically belonged to parents, grandparents or even great-grandparents. The first job was clearing the overgrown grass and weeds from the tombs. This is only done once a year, so it is usually a time-consuming process started in the morning. Some people used machetes, while others burned the overgrowth. 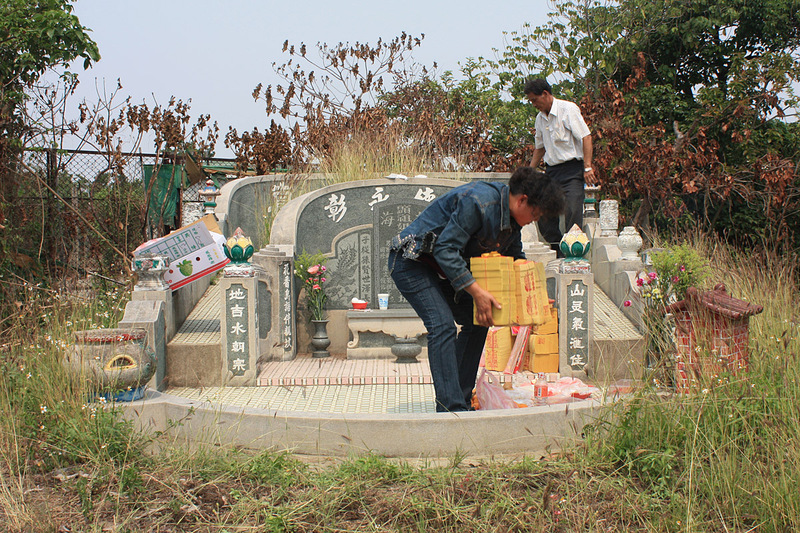 Families reunited to clear and clean traditional tombs around Taiwan. As part of the ceremony, offerings are made to deceased ancestors. Offerings were made to the ancestors. Food was laid out on the tomb pavilion, presented with smoking incense. Ghost money was burned in piles next to the tomb to offer to the ancestors. Ghost money was also “planted” in the large dirt mound of the tomb to complete the ceremony. 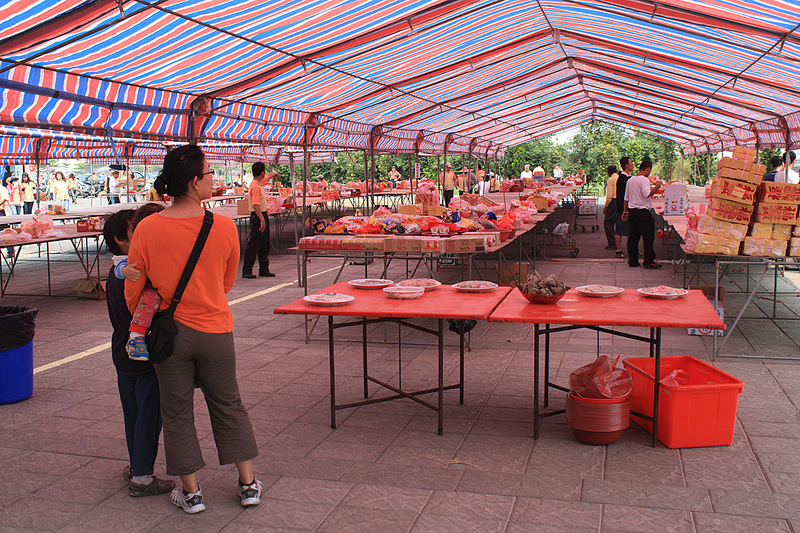 Tomb sweeping ceremony is an important social event for families. The Tomb Sweeping ceremony is not only significant for honoring the ancestors, but it is also an important occasion for families to reunite. It is one of the few times a year where people from all over come together to join their families. The ceremony becomes and important social event for families, strengthening family bonds and reasserting the importance of ancestry. 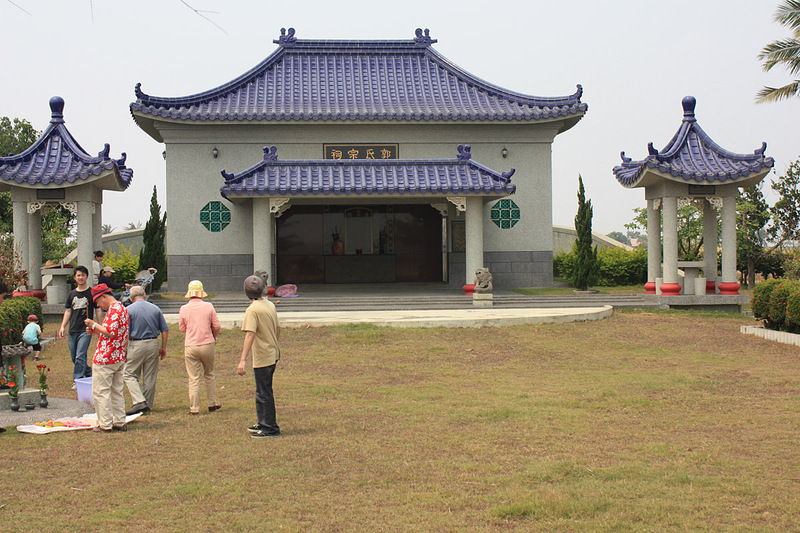 A mausoleum for the Kuo families in an area of Tainan County. As development takes over areas of traditional family burial plots, the remains of the deceased are either moved to mausoleums designated to specific families or they are moved to public cemeteries. 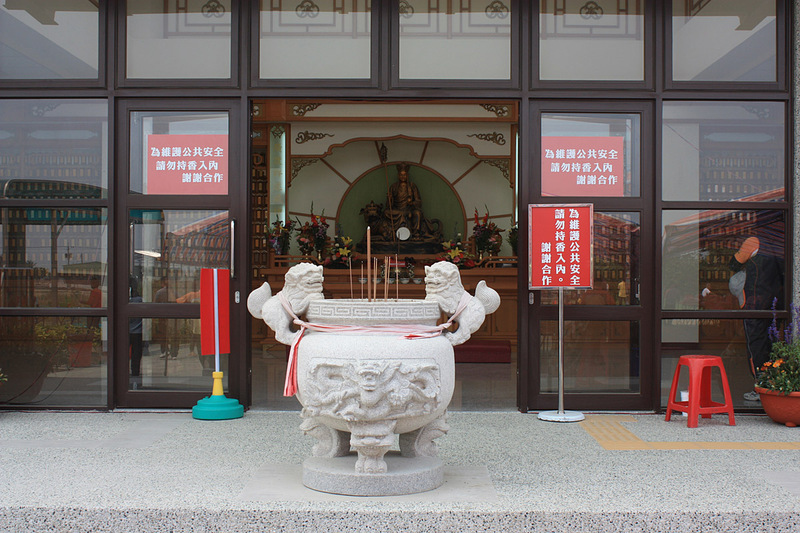 You will rarely find the traditional outdoor tombs in the developed cities of Taiwan. In large cities, modern, multi-story buildings housing the ashes of the deceased are more commonplace. 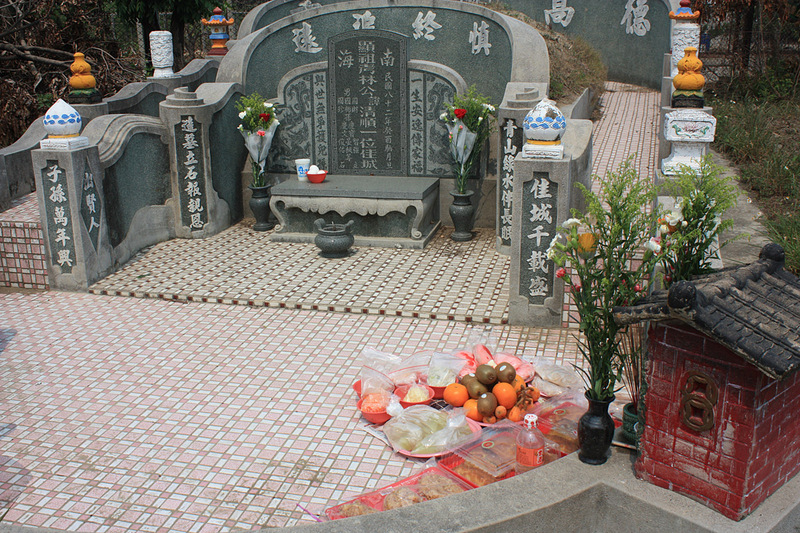 These public cemeteries hold ceremonies during Tomb Sweeping Day as the community gathers to offer food, ghost money and to pray. A public cemetery in Sigang Township, Taiwan. In smaller towns, the family mausoleums are commonplace. You will see ornate buildings resembling small temples housing the ashes of specific families, such as the “Kuo,” “Hsu” or “Liu” families. Different families congregate and work together to maintain the facilities and hold ceremonies throughout the year. Ceremonial tables for the community to make ancestral offerings. 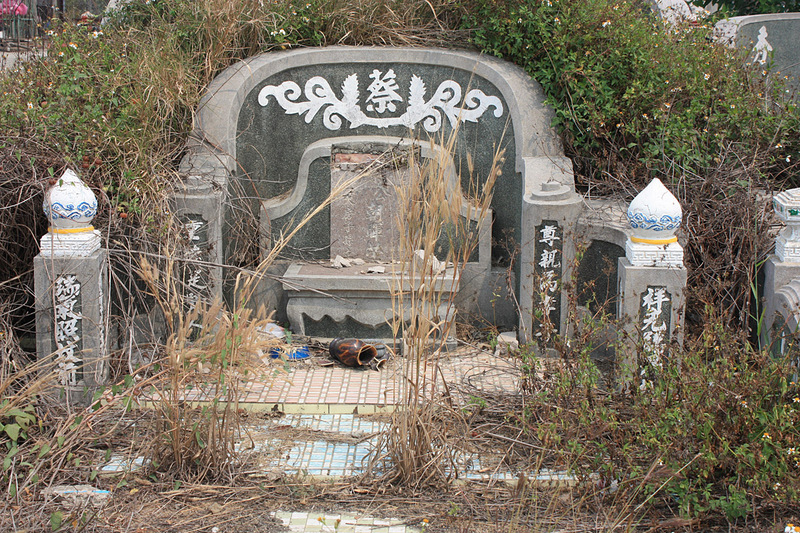 Perhaps in a few generations, the traditional Chinese tombs will be a distant memory. Already, I saw many tombs that were overgrown by tall grass and trees, as they were forgotten by relatives. 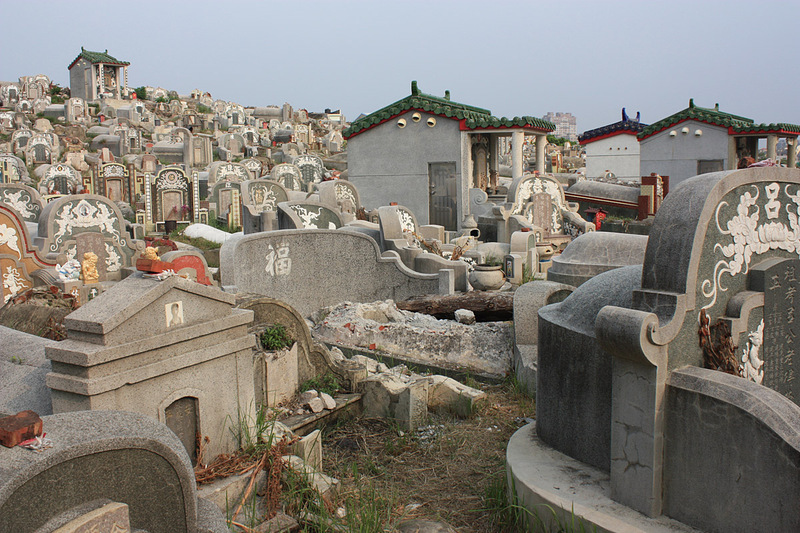 More importantly, on an island that is densely populated by people who are increasingly busy, it is becoming less practical to maintain the traditional Chinese tombs. The time and effort to show respect and love for the deceased is diminishing. In a society driven by practicality and convenience, many aspects of traditional culture are sacrificed. Tomb Sweeping Day is no different. Those who can still see the efforts of entire families that gather once a year to honor their ancestors will appreciate what the ceremony means to families who place an importance on their ancestry. Click to view this article on CNN iReport. Very interesting Tony. I think it is sad how some traditions fad away. As you know, you see that here in the states as well. I’ve lived in Taiwan intermittently since the 70’s and have noticed the same things you did such a good job presenting. My family in Taiwan used to observe Tomb Sweeping Day in the traditional manner, where all the relatives got together to honor their ancestors. Now, many of the deceased remains have been cremated and placed into more public facilities instead of on family land. As Norman Wright Jr. mentions above, we see the same thing in the U.S. now, with old traditions fading away.